K-pop boy band BEAST concluded the promotions of their first studio album “Fiction and Fact” on a high note, topping music charts and sweeping awards on Korean TV music shows. The album was released online on May 17 and on the same week, the group began performing the title track “Fiction” on TV shows Mnet “M! Countdown”, KBS “Music Bank”, MBC “Music Core” and SBS “Inkigayo”. With the support of their fans, they bagged eight chart awards. 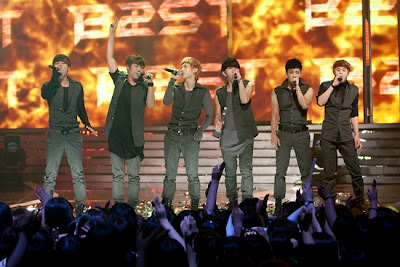 BEST won their first music chart award on May 26 on “M! Countdown”, defeating 2NE1 and Baek Ji Young. They repeated their triumph on the same program on June 2 and June 9, thereby winning the award for three consecutive weeks. And since their debut in 2009, BEAST achieved their first triple crown on “Music Bank”, capturing the K-Chart award for three consecutive weeks starting on May 27 (for their song “On Rainy Days”) followed by awards for “Fiction” on June 3 and June 10. On “Inkigayo”, BEAST won the chart award on June 5 and June 12. “Fiction and Fact” is BEAST’s bestselling album so far. The album sold 90,000 and topped the Gaon chart for the month of May. The album was also No. 1 for the month of May on the Hanteo chart. With their achievements for the album, BEAST has now risen through the ranks to become one of K-pop’s hottest singers. After their album promotions, BEAST will head to Japan on June 20 to promote their second Japanese single “Bad Girl”. Recently, “Bad Girl” topped “Recochoku” ringtone website, Japan’s largest mobile site. The group’s first Japanese single “Shock” also topped the same chart back in March. Last June 14, BEAST flew to Japan and held a surprise live performance of “Bad Girl” at the Tokyo Shinjuku Station Square before about 5,000 fans. The group will also hold their fan meeting and Asia tour in Malaysia on July 1. Filipino fans are hoping that BEAST will also hold the same event in the Philippines. BEAST debuted in the K-pop scene in October 2009. The group is composed of leader DooJoon, Hyunseung, Kikwang, Junhyung, Yoseob and Dongwoon.